On Wednesday, May 2, 2018 at approximately 1:18PM, the Washington County Sheriff’s Office responded to 17342 Shepherdstown Pike Sharpsburg Washington County Maryland for an unattended death investigation. A family friend came to the house at approximately 11:00AM to collect several bales of hay. The family friend stated that it appeared that no one was home and the family’s truck was missing. The property is a working farm with cattle that require daily care, he noticed the cattle had not been fed or watered. Additionally, a neighbor made contact with the family friend because Jack Rowland, who lives in the residence with his mother, Evelyn Rowland, was supposed to meet him earlier in the morning and never showed up. The family friend contacted a family member and informed her of their concerns for Jack and Evelyn. They advised Deputies that the family friend checked the house at the request of the family member and located Jack and Evelyn deceased within the residence. Deputies entered the residence and located Jack Rowland deceased in the dining room, it appeared that he sustained a gunshot wound. Evelyn Rowland was located deceased in the living room of the residence. It appeared she also sustained a gunshot wound. During a search of the house it was discovered that a single shot shotgun was missing from a gun cabinet within the residence. It was also determined that the rear door to the residence had been forced open. 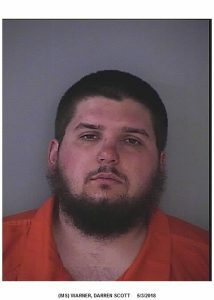 During the course of the investigation, Detectives received information that Evelyn’s grandson has been caught stealing from the farm and other family members. The Grandson was identified as Darren Scott Warner, 24, currently of Smithsburg. Detectives were also advised that Warner had lived at the residence for approximately 4 years and was familiar with the house and property. A look out was given to law enforcement agencies within Washington County and surrounding areas for the GMC pickup truck stolen from the farm. Shortly after the lookout was given, Smithsburg Police passed a residence at 12110 Crystal Falls Drive and observed the stolen GMC pickup in the drive way of the home. Smithsburg Police also observed Darren Warner inside the stolen truck with the passenger side rear doors open. Warner exited the stolen truck and walk inside the residence. A white female was also observed exiting the residence and opening the passenger door of the pickup truck. The female was observed rummaging in the stolen truck for several minutes and then closing the door and returning to the residence. 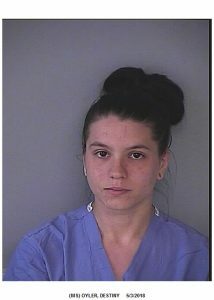 The female was identified as Destiny Oyler, 20, of Smithsburg. A perimeter was set around the residence; the Washington County Special Response Team responded to the residence and took Warner and Oyler into custody. The keys to the stolen pickup truck and clothing items with dark stains, consistent with possible blood spatter, were located within the residence. Darren Scott Warner and Destiny Oyler have both been charged with 2 counts of 1st degree murder, 2 counts of conspiracy to commit 1st degree murder, 2 counts of 2nd degree murder, 2 counts of conspiracy to commit 2nd degree murder, 2 counts of 1st degree assault, burglary, theft and motor vehicle theft. Both are currently being held at the Washington County Detention Center on no bond. We are asking that is anyone who has purchased equipment, tools or machinery from either Warner or Oyler within the last couple of days; please contact Lt. Alton, 240-313-2185. We also ask that anyone store or business that may have had accepted a large amount of coin currency from either suspect within the last several days, please contact Lt. Alton. May 19 from 9:00 a.m. to 1:00 p.m.
unwanted medications in a safe and secure manner. The shredding service is for residential/personal documents only, with a three (3) document box maximum per household.